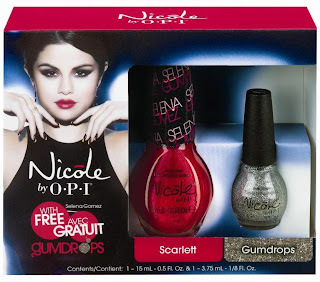 Nicole by OPI announces two new gift sets for holiday featuring nail lacquers inspired by actress and singer Selena Gomez. Available in October, each gift set includes a Selena Gomez lacquer plus a free mini bottle of silver Gumdrops; a limited edition matte textured shade – only available in these sets. Gift set #1 includes Pretty in Plum (this picture-perfect purple is a genuine beauty) and gift set #2 includes Scarlett (this shimmery red-violet is leading lady lovely). “Perfect for holiday festivities or as a stocking stuffer, lacquer fans can try these shades separately or mix them together to create dual sparkle and texture” explains Suzi Weiss-Fischmann, Nicole by OPI Executive VP & Artistic Director. Nicole by OPI formulas are long-lasting, fast-drying, and salon-quality. These limited edition gift sets will be available beginning October 2013 for $7.99 each at retailers including select CVS, Ulta, Kmart, Kroger, H-E-B, Duane Reade locations. In Canada, these sets will be available for $10.99 each at Shoppers Drug Mart, Jean Coutu, Rexall, London Drugs, Familiprix, Uniprix and Brunet.